Posted on August 12, 2016 by Welsh Food. 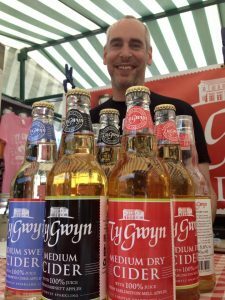 The Monmouthshire Food Festival comes to you at the time of autumn plenty with a full programme of demonstrations, talks, tastings and lots of food and drink to try and buy. The Demonstration Theatre features many of Monmouthshire’s best chefs who will give a taste of the county’s finest hotels and restaurants. We are also delighted to welcome a number of new chefs to the Demonstration Theatre. 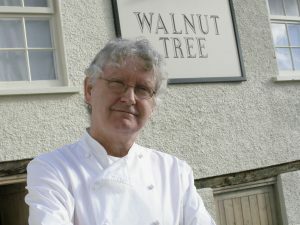 Shaun Hill chef/patron of Michelin starred restaurant the Walnut Tree near Abergavenny will be joining us for the first time. Shaun Hill is one of Britain’s most enduringly successful chefs. During his long career he has forged a unique style with a string of timeless dishes. He shows no sign of slowing up and still ‘shakes the pans’ (Hill’s typically self deprecating term for the job of the professional chef) at The Walnut Tree. Charles Rouse chef/patron of the Chainbridge Inn near Usk will also be joining us for the first time. Charles is a rising star on the food scene in Monmouthshire. Expect to see something different when Charles takes to the stage in the Demonstration Theatre. His cooking style features molecular gastronomy forged when he worked for Heston Blumenthal. Some of the cleverest canines around will be attending the Monmouthshire Food Festival, courtesy of Guide Dogs Cymru. The charity is offering visitors a chance to get up close to a guide dog or puppy and find out more about their vital work. Guide dog owners will also take a leading role in cookery demonstrations, showing how blind and partially sighted people prepare mouth-watering meals from scratch. Younger visitors can put on a blindfold and try their hand at buttering bread, making jam sandwiches and preparing juice drinks. For a brief insight into living with sight loss, take a blindfold walk in the Sensory Tunnel. The Look and Learn Theatre offers an interesting programme of talks, demonstrations and tutored tastings. Watch Jules James, master chocolatier from Black Mountain Gold as he shows how to dip truffles and temper chocolate and much more. Tasters will be on hand. Henry Ashby, renowned local forager, will talk about the many varieties of wild food that autumn has to offer. Wild food has become better known as many chefs are now using them as ingredients in their dishes. He will also have a display of foods to illustrate his talk. The Producers Market offers delicious food and drink to try and buy. The food producers join us from Monmouthshire and neighbouring counties together with the finest producers from across Wales. The county of Monmouthshire has some of the finest producers in the Wales. Castles Brewery is located just a mile and a half from Caldicot Castle drawbridge, you don’t get more local than that. A little further afield is the Parson’s Nose from Dingestow near Monmouth. The meat for their sausages and burgers is reared on their farm using traditional free range farming methods. Just over the border in Newport is Baked on Green Street from Redwick, who make the most divine doughnuts. Jessica is sure to have a new variety especially for the food festival. Avril’s Country Kitchen from Llanwern Village, are makers of the finest preserves. Their jams and chutneys are made from the freshest fruit and vegetables, many of which come from their own garden or foraged from local hedgerows. We are delighted that the Children’s Quarter will once again be hosted by the Monmouthshire Youth Service. They will have lots of activities to engage, entertain and educate our younger visitors.